We offer traditional decoration and wooden Ottoman style hand made furnishings with FREE Wireless Internet, VRF individual controlled Daikin Brand Air Condition,LED TV with International Channels, Electronic Safe Box,Coffee/Tea making facilities,Minibar,Luggage Stand, Makeup/Full Length Mirror,Smoke Detector,Direct Dial Phone, Hair-Drier,Aromatic Soaps/Shampoo...etc. An open buffet tasteful breakfast is served on our Terrace with Magnificent view of Bosphorus. Standard Double room is to accommodate 1 or 2 person. There is one double bed in our Standard Double Room.We cannot offer twin beds (two single beds) in our Standard Double Rooms. 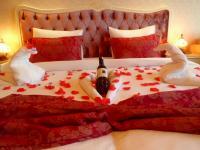 We can offer twin beds in our Superior Rooms. Special Pricing is valid for Direct Reservation Discount with the Cash Payment in USD, TL or Euro during Check-In. The Price has breakfast included. Credit Card Will Not Be Charged Only Needed For Reservation Guarantee. The price inclues Breakfast and VAT and Valid for Direct Reservation to our Hotel with Credit Card Guarantee. Traditionally decorated Economy Room is smaller than Std Double Room with half window. It has Air Condition, LED TV, coffee/tea making facilities and private bathroom. We offer traditional decoration and wooden Ottoman style hand made furnishings with FREE Wireless Internet, VRF individual controlled A/C,LED TV with International Channels, Safe Box,Coffee/Tea making facilities,Minibar,Luggage Stand, Makeup/Full Length Mirror,Smoke Detector,Direct Dial Phone, Hair-Drier,Aromatic Soaps/Shampoo...etc An open buffet tasteful breakfast is served on our Terrace with Magnificent view of Bosphorus. Superior room is the most spacious room to accommodate 2 or 3 person.It can be one king size bed (180cmx200cm) or two single beds as twin beds. We need our guest's preference in advance for preperation of beds. As per request, we can accommodate one extra bed in Superior rooms and convert it to Superior Triple Room. Family room is spacious enough to accommodate 4 person.It can be one king size bed (180cmx200cm) and two single bed or four single beds. We need our guest's preference in advance for preperation of beds. Triple room is spacious enough to accommodate 3 or 4 person.It can be one king size bed (180cmx200cm) and one single bed or three single beds. We need our guest's preference in advance for preperation of beds. As per request, we can accommodate one extra bed in triple rooms, please contact us for triple room with extra bed.